GREENSBORO, N.C., USA, September 18, 2018 – Syngenta has released a new learning module to provide retailers, applicators and growers with information about Miravis® Ace fungicide, which delivers groundbreaking control of Fusarium head blight (head scab) and Septoria leaf spot. Miravis Ace features Adepidyn® fungicide, an SDHI mode of action recently registered by the U.S. Environmental Protection Agency, and will be available for sale in the 2019 season. The interactive, mobile-friendly learning module consists of four parts that provide an overview of Adepidyn fungicide, Miravis Ace, application timing and performance. 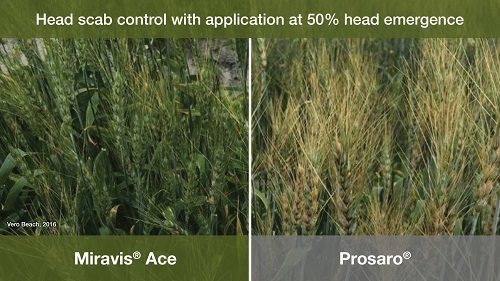 A variety of comparison images and graphics demonstrate the effectiveness of Miravis Ace versus competitive brands, when applied at flowering and at 50 percent head emergence. The learning module demonstrates the unique ability of Miravis Ace to enable head scab applications as early as 50 percent head emergence. Users will learn how Miravis Ace gives wheat growers a head start on head scab control and how its additional benefits for Septoria leaf spot control can help drive yield and reduce DON levels. After completing the learning module, participants can take a short quiz to test their knowledge and receive CEU credit. To access the learning module, visit MiravisAceLearningModule.com. For more information about Miravis Ace, follow the link below in the web resources section. Join the conversation online – connect with Syngenta at Syngenta-us.com/social. Performance assessments are based upon results or analysis of public information, field observations and/or internal Syngenta evaluations. ©2018 Syngenta, 410 Swing Road, Greensboro, NC 27409. Important: Always read and follow label instructions. Some products may not be registered for sale or use in all states or counties. Please check with your local extension service to ensure registration status. Miravis Ace is sold as a combination of separately registered products: Miravis Ace A and Miravis Ace B fungicides. Adepidyn®, Miravis® and the Syngenta logo are registered trademarks of a Syngenta Group Company. All other trademarks are the property of their respective owners.